The sprawling 215,000-sq.-ft. Icon Metal Forming plant in Corydon, IN, has a long, rich history as a Tier One supplier to Ford and General Motors, among other OEMs. Once a family-owned operation, the plant’s timeline includes a 7-yr. stretch as Oxford Automotive. Acquired by Martinrea in 2005 and coined Icon (to serve as the “icon of manufacturing for the company,” says Icon general manager Kyle Kasey), plant management most recently has turned its attention to boosting output from its burgeoning pressroom. Icon’s new feed line, installed on a 2000-ton transfer press, features a four-roll servo feeder to ensure optimum coil-feed accuracy, particularly beneficial when feeding higher-strength steels. The four-roll feeder, which provides twice the surface contact with half the air pressure of a two-roll feed, helps prevent slippage that can cause marking on the material or lead to inaccurate feed lengths. “Work load and part volumes have climbed steadily over the last 12 to 18 months,” Kasey says. Much of that growth emanates from three major GM programs (Icon earned a 2015 GM Supplier Excellence Award) that have more than doubled the facility’s steel consumption—from 1 million to 2.1 million lb./week. 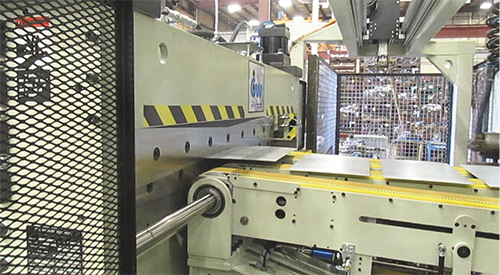 Examples include the development of standardized robotic-welding cells, a commitment to quick-die change in the pressroom and, most recently, completely refreshing one of the company’s workhorse stamping lines, featuring a 2000-ton 15-yr.-old transfer press. 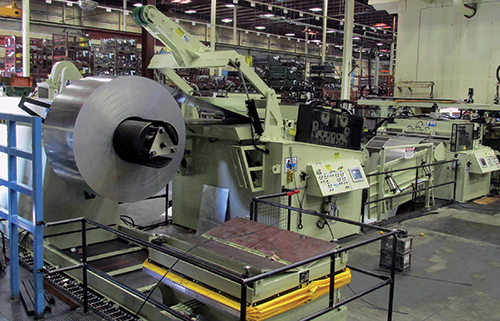 Late in 2015, the press, whose transfer system recently was upgraded to all-servo, welcomed a new servo-feed coil line equipped to handle higher-strength steels. Icon’s pressroom features three 2000-ton transfer presses, as well as eight progressive-die presses (150 to 1000 tons) and a seven-press tandem line (500-ton presses). A Komatsu transfer press installed in 2000 has been the most recent beneficiary of upgrade attention. The 72-in.-wide wide 50,000-lb.-capacity feed line incorporates a hydraulic cut-to-length production shear with a blank destacker. The setup allows continuous coil, rectangular blanks or developed blanks to feed from the same system. Fast forward to August 2015 and we find the transfer press in full-out production mode with its newly installed Tri-Function feed line from Cooper-Weymouth Peterson (CWP), Clinton, ME. The 72-in.-wide, 50,000-lb.-capacity feed line incorporates a hydraulic cut-to-length production shear and a blank destacker. The setup allows continuous coil, rectangular blanks or developed blanks to feed from the same system. It’s freed up one of Icon’s progressive-die presses from having to produce blanks, adding capacity to the company’s pressroom. The feed line also features a servo-driven magnetic runout conveyor that transfers blanks created in the cut-to-length mode into the transfer press. The conveyor, with a 24-in. adjustment into the press, also can feed developed blanks. Also included in the line is a coil car, holddown peeler system and two-axis servo pick-and-place destacker. Icon Metal Forming stamps an array of small- to medium-sized automotive body-in-white stampings, delivered to its inhouse resistance-welding cells as well as to its sister engine-cradle assembly plant in Riverside, MO. The feed line is equipped with a control-automation package to automate setup based on preprogrammed job or part numbers. Feed progression, speed, straightener-head settings, material width for stock-guide location, uncoiler brake tension and magnetic conveyor settings all store in memory for each job. The control also can calculate initial straightener-roll depth settings based on material parameters, removing the guesswork. Overall, the control is a big contributor to quickening the pace of die changes. Of course, higher throughput in the pressroom means that downstream welding operations can’t become bottlenecks. Here, the plant has been busy standardizing its resistance-welding cells and replacing outdated equipment with new robots and servo guns. Icon stamps an array of small- to medium-sized stampings, delivered to its inhouse resistance-welding cells as well as to its sister engine-cradle assembly plant in Riverside, MO. Among its high-volume jobs are structural apron parts, cross members and other body-in-white parts. All of the company’s efforts in the last couple of years to drive productivity have added up to allowing Icon to a doubling of throughput from Icon’s pressroom, with only a nominal increase in head count and without adding new presses. For example, the 2000-ton Komatsu transfer line now runs at 17 to 20 strokes/min., up from 12 to 14 strokes/min. prior to the upgrades. The press, with a 108 by 216-in. bed, stamps 16 different production parts, and several service parts. Of these, 75 percent utilize the inline shear and blank-handling setup (in progressive mode, the shear stays open and the coil feeds through directly into the press). And, the press’s original transfer system also received a refresh in 2015, with state-of-the-art Rockwell servo drives added on all three transfer axes to further increase press versatility.